This article explains discovery of types at runtime using .NET Reflection in C#. 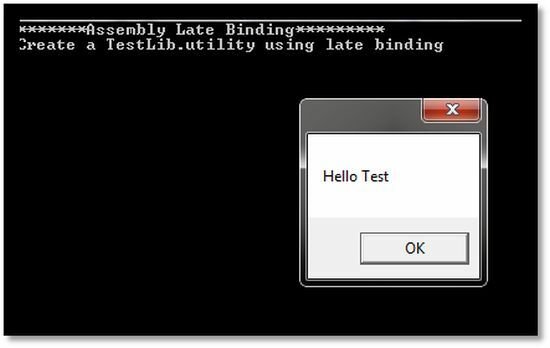 This article will also explain late binding in C# that is related to .NET reflection. Assemblies are the core unit of deployment. At design time, we can examinethe CIL code in a set of reference assemblies with a couple of external tools such as Reflector and ildasm to peek into underlying metadata, MSIL code and the manifest. But many times it is necessary to discover types at runtime, and this is the situation where .NET Reflection can be used. This article will also explain late binding that is very related to reflection. Reflection typically is the process of runtime type discovery to inspect metadata, CIL code, late binding and self-generating code. At run time by using reflection, we can access the same "type" information as displayed by the ildasm utility at design time. The reflection is analogous to reverse engineering in which we can break an existing *.exe or *.dll assembly to explore defined significant contents information, including methods, fields, events and properties. Assembly This static class allows you to load, investigate and manipulate an assembly. AssemblyName Allows to exploration of abundant details behind an assembly. EventInfo Information about a given event. PropertyInfo Holds information of a specified property. MethodInfo Contains information about a specified method. Technically, the act of loading external assemblies on demand is known as Dynamic Loading. Using the Assembly class, we can dynamically load both private and shared assemblies from the local location to a remote location as well as, explore its properties. If you wish to make this program more flexible then you can update your code to load the external assembly using the LoadFrom() method. In such a situation you don't need to place the external assembly in the Bin\Debug folder. The .NET framework can create an instance of a given type using early binding or late binding. In early binding, we typically set the external assembly reference in the project and allocate the type using the new operator. Early binding allows us to determine errors at compile time rather than at runtime. Whereas in late binding, you can create an instance of a given type and invoke its methods at runtime without having knowledge at compile time. There is no provision to set an external assembly reference in this construct.